Bryson Michael's Blog: 400th Post! Because I had to switch Google Analytic accounts last year, the stats on my blog do not start from the creation of my blog on March 8th, 2008, they now start on January 15th, 2010. 2 years of lost stats on my website =(. Top 3 states with most views: Oregon (378), Washington (176), California (78). Blowin up on the West Coast! Country that views my website the longest per visit: Austria with 3 page views for an average of 11 minutes and 14 seconds. with 2 page views for an average of 54 seconds. 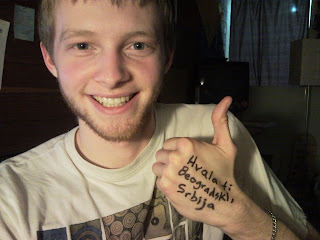 "Hvala ti Beogradski, Srbija" is Serbian for "Thank you Belgrade, Serbia"